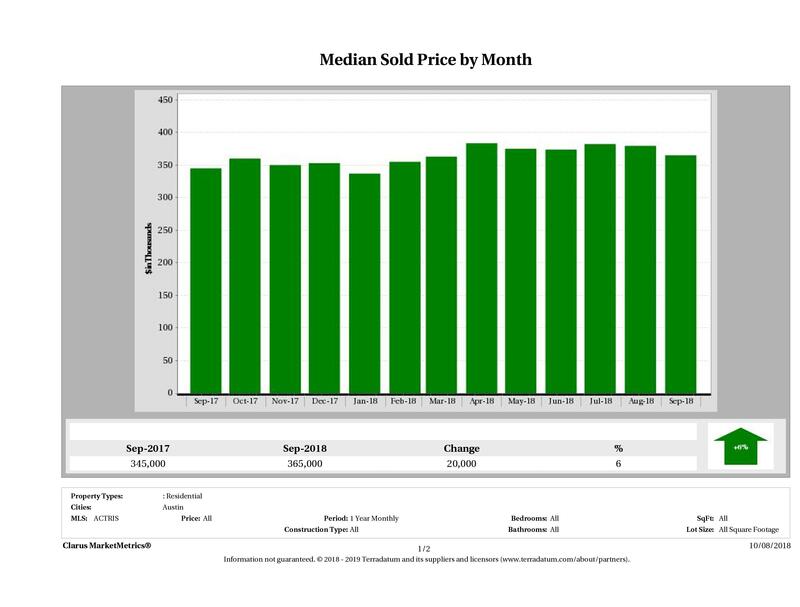 Eleven Oaks Realty is proud to present their September 2018 Austin Real Estate Price Report measuring activity in the Austin single family home market. The biggest story this month: median home prices in Austin up again this month. The median price of an Austin home in September 2017 was $345,000 compared to $365,000 in September 2018, up 6% ($20,000) in year over year numbers. This is good news for sellers who may have been dealt a dose of reality with July’s numbers. 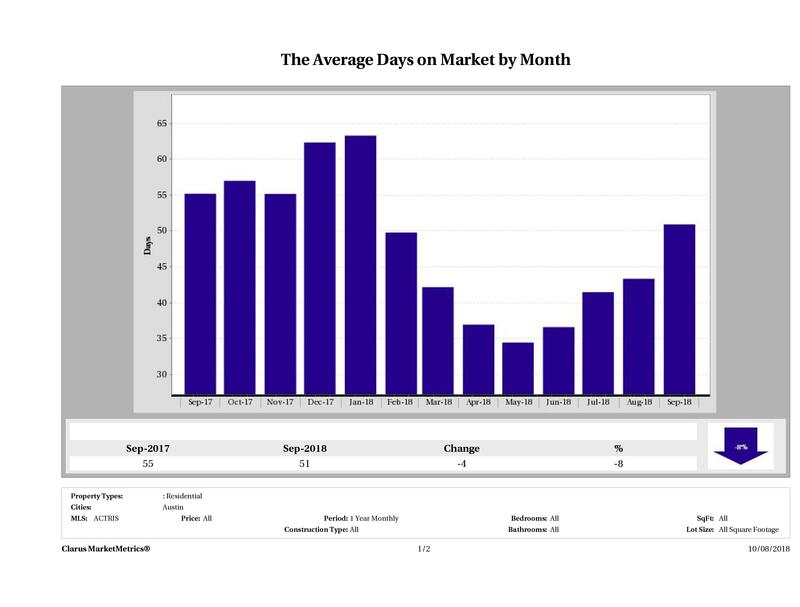 In September 2018, it took 51 days to sell a home in Austin, on average, compared to 55 days in September 2017, marking an 8% decrease in year over year numbers. 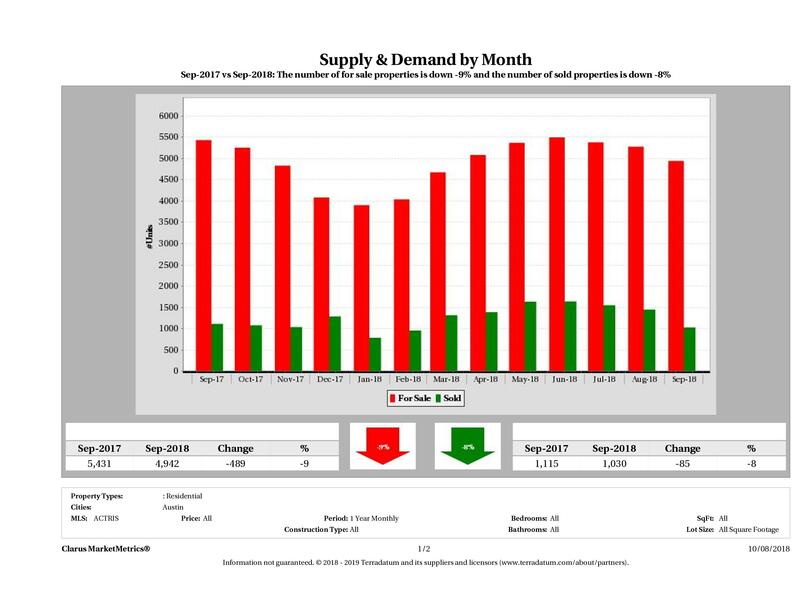 In September 2018, there were 407 homes taken off the market compared to 452 in September 2017. This marked a 10% (45 home) decrease in year over year numbers. We continue to see unrealistic sellers take their homes off the market rather than lower the price. 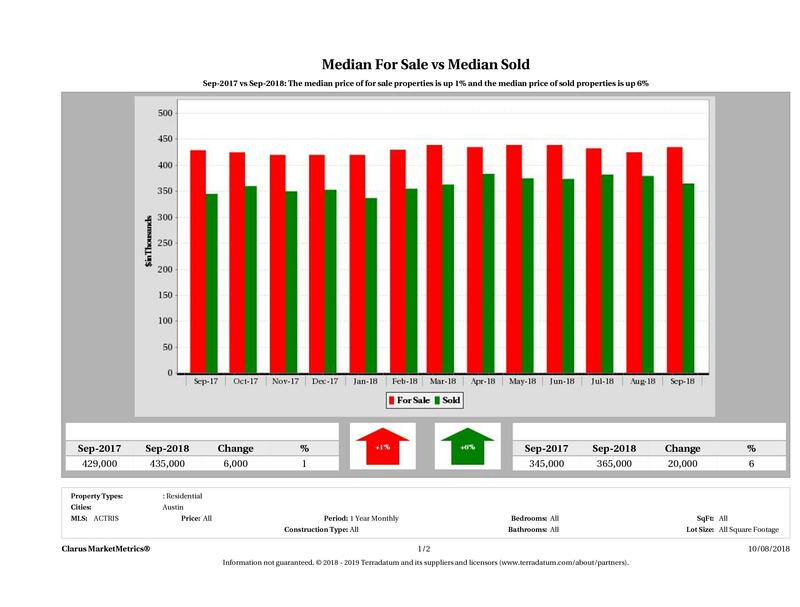 In September 2018, Austin saw an 8% decrease in the number of homes sold from September 2017 to September 2018. 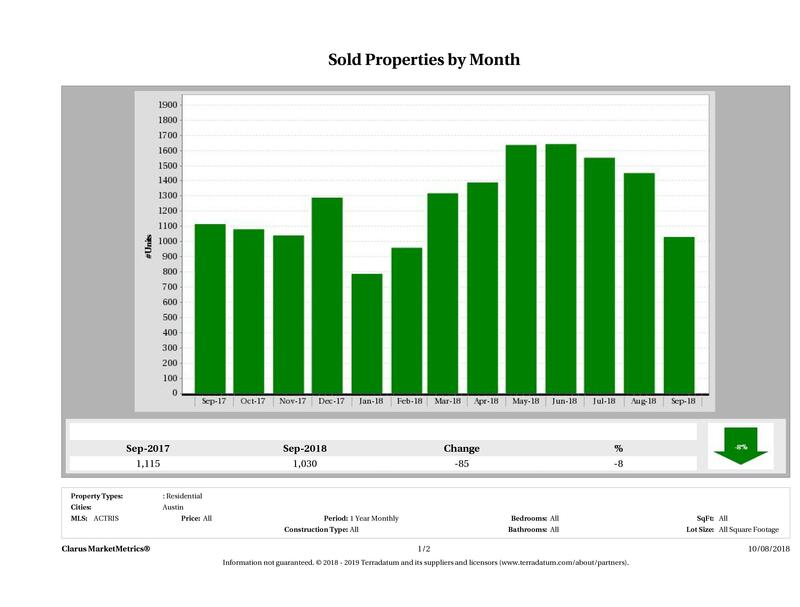 In September 2018, we saw 1,030 homes sell in Austin compared to 1,115 in September 2017 marking an 8% decrease (85 homes) in year over year numbers. 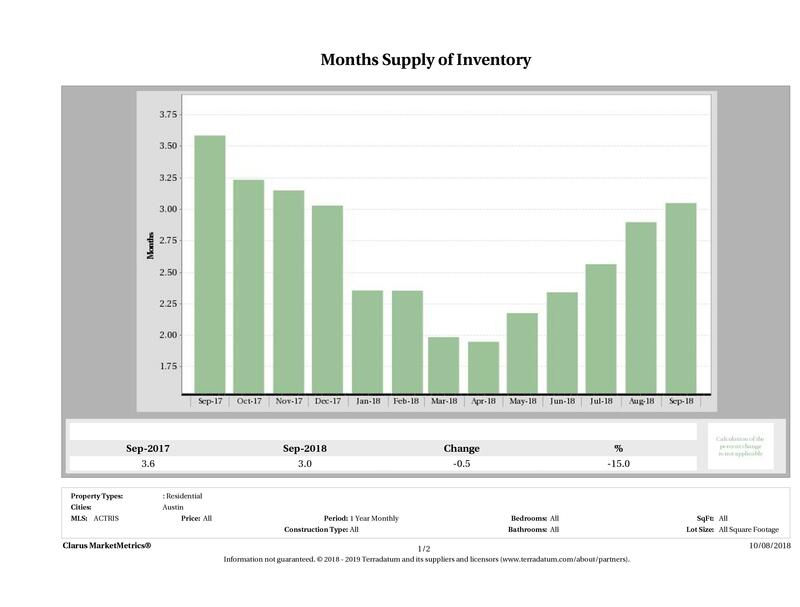 In September 2018, we saw 3.0 months of inventory on the market, compared to 3.6 months of inventory in September 2017, marking a 15% decrease in year over year numbers. For the past year, we’ve consistently seen extremely low inventory levels and this month appears to be no different. 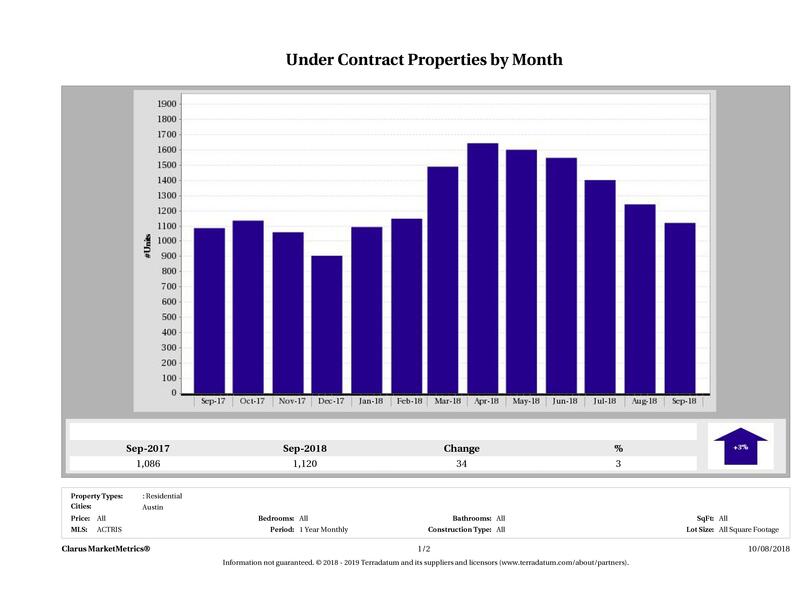 In September 2018, 1,120 homes went pending (under contract) in Austin compared to 1,086 in September 2017, marking a 3% (34 home) increase in year over year numbers. 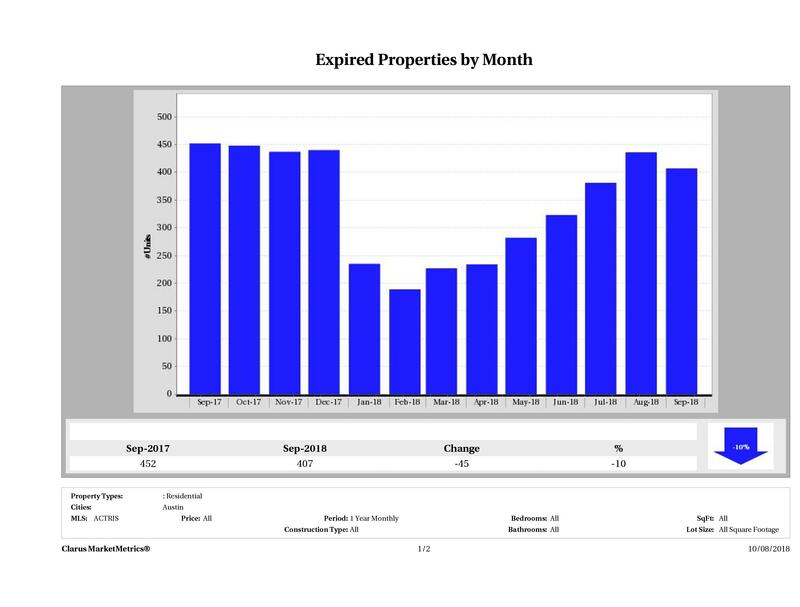 In September 2018, we had 4,942 homes for sale in Austin, compared to 5,431 in September 2017, showing a 9% (489 home) decrease in year over year numbers. With inventory numbers already low this year, even a small drop will be felt by buyers looking for more choices. In September 2018, we saw 1,343 homes introduced to the market compared to 1,434 in September 2017, a 6% (91 home) decrease in year over year numbers. This month we saw a 9% decrease in supply (number of properties for sale) and an 8% decrease in demand (number of sold properties). 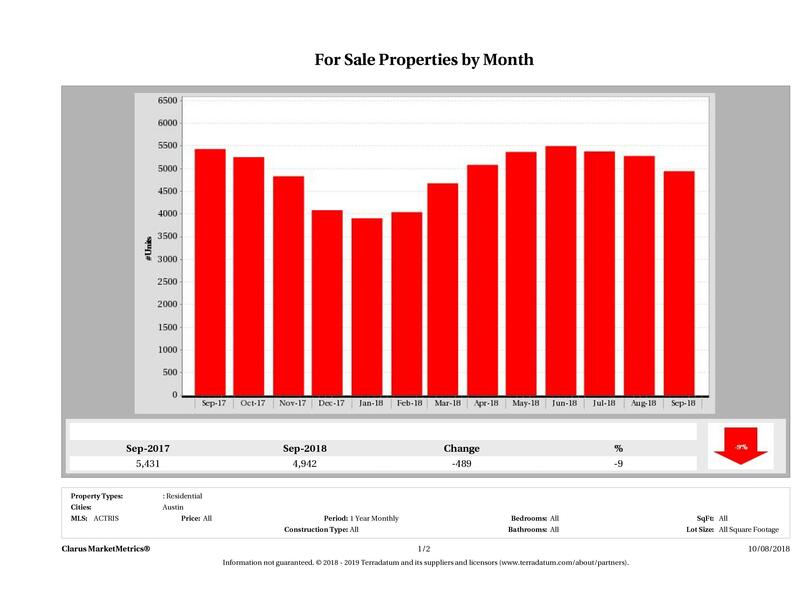 For those of you who prefer to see the actual numbers, we’ve included the figures for September 2018 Austin home sales below. The most expensive home that sold in September 2018 sold for $6,100,000 and the least expensive home sold for $120,000. Homes ranged in size from 408 sqft – 18,000 sqft with an average size of 2,562 sqft. The average price per square foot for a home that sold in Austin in September 2018 was $229.77 with the lowest being $74.06/sqft and the highest being $1,167.89/sqft. It took, on average, 67 days to sell a home in Austin and sellers received, on average, 96.01% of their original list prices.